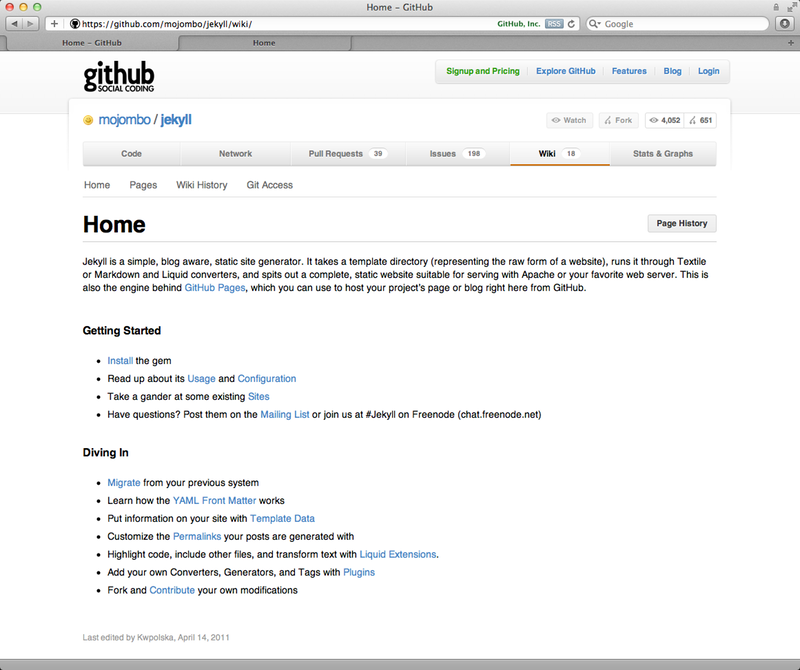 Over a year ago, GitHub updated their wiki system to be powered by git. It was an awesome upgrade. 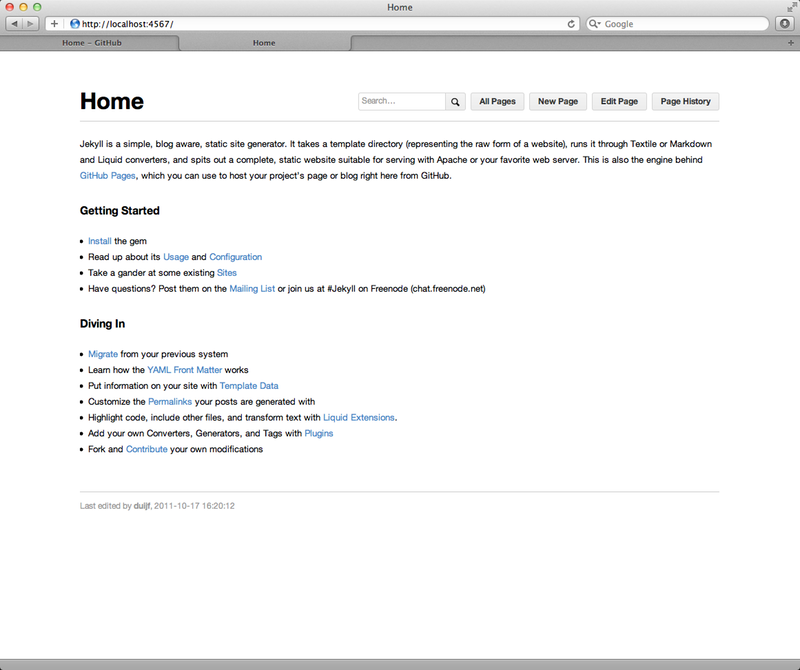 Now I can check out a wiki, just like source code, and edit it in TextMate, just like source code. Really, really nice…except I can’t search. Luckily, GitHub released Gollum. Gollum is a local version of their wiki software, wrapped up in a Ruby gem. It supports the same interactions that you get on a GitHub wiki. And, it supports search. To set up Gollum, just open Terminal and follow the instructions below, using @mojombo’s jekyll as an example project. # Install the gem. I'm using 1.3.1 with Ruby 1.9.2 (290). # Go to a GitHub wiki checkout. # Install RedCloth to handle Jekyll's Textfile format. Still, remembering to run gollum and open localhost:4567 is a bit of a pain. Contrary to the linked post, I didn’t need to add anything to /etc/hosts. Pow just worked. Gollum 1.3.1 is fine, despite the comments in this ServerFault post. Just open http://wiki.dev. A brilliant addition to Gollum is sidebar support. I committed _Sidebar.mediawiki to the wiki repo, and Gollum began displaying it next to each page. The sidebar is a really easy way to add a set of useful links to all pages. Keep in mind that if changes aren’t committed, Gollum doesn’t see them. For example, I added _Sidebar.mediawiki to the repo folder and refreshed the browser page. No sidebar. Took me a bit to realize Gollum still didn’t see it. You have to commit changes for them to exist to Gollum. GitHub spells this out in its gollum readme, but it’s worth reiterating. Gollum sanitizes the input with @rgrove’s sanitize gem, removing any malformed HTML or security issues like custom CSS. This sanitization converts red into red. To change that setting locally, just find lib/gollum/sanitization.rb and add ‘style’ to the end of the ATTRIBUTES list. Your local version will use the custom CSS, and the GitHub version will silently strip it out. I switched to a GitHub wiki from a MediaWiki instance. Converting was easy: click Edit for each page, save the contents as Page.mediawiki, repeat, push to GitHub. Done. # Fetch the sources from GitHub. # Build master and install that gem. # Restart Gollum with Pow. Of course, GitHub will add searching on the website eventually. They’re prodigious coders, and Issues already has search. I’m sure they’re getting to it. Until then, just open http://wiki.dev/ and search.